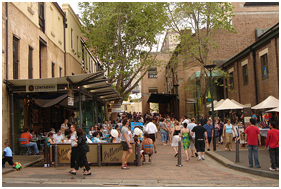 This is the oldest part of Sydney with a story around every corner, The Rocks will intrigue, fascinate and entertain you. Prepare to explore narrow streets, stroll along cobblestone streets and traverse historic sandstone steps. The place where the first European settlers stepped ashore on 26 January 1788, The Rocks is a trip back in time. But with 19th century warehouses converted to chic restaurants, stylish bars, hearty pubs, interactive museums, artisan markets, eclectic shopping and free events, it's also a place to enjoy today. Explore the ‘secrets of the sandstone' and local events and history in a 90-minute walking tour with The Rocks Walking Tours. The guides will entertain you and bring to life the stories of The Rocks' colorful past. One of the great things about Sydney is there is both culture and lots of fun activities as well.